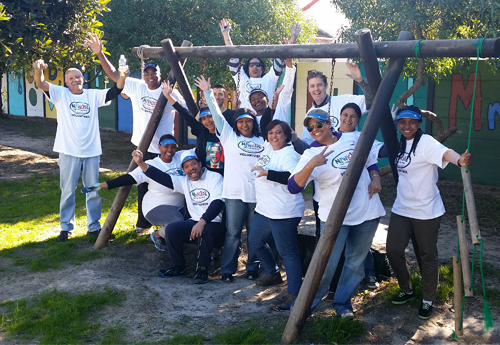 While you could say that houses are built with concrete, boarding, brick and paint, at Newkidz the homes we makeover are built with love and care – and you! All our makeover projects are successfully completed through the enthusiastic and dedicated efforts of the volunteers we have on our database. We are able to do work that might normally take weeks in just 1 – 3 days, because we are blessed to have many hands and hearts working hard together to make an extreme difference. By registering your interest with Newkidz, your details will be added to our volunteer database. As a volunteer, you will be kept updated about Newkidz activities and especially about upcoming projects. As we plan projects and activities, we will identify how many volunteers we need for each, and what the roles are that need to be filled to get the work completed to our high standards in the most efficient way. We will then send out a call for volunteers to be part of the challenge and excitement. Calls for volunteers for specific projects go out via email, Facebook and Twitter (Like Newkidz on the Block on Facebook stay up to date with the latest news and opportunities). When you sign up for a specific project, you will get more information about that project, so that you are well-informed when you arrive at the project site. On the day of action, you will register, meet the Project Co-ordinator and fellow volunteers, be directed to your task(s), work hard, laugh a lot, have fun, work some more, and make a positive difference in the life of our most vulnerable children. There is a place for every willing person to contribute at Newkidz – we need volunteers for everything from project team leaders, painters, registration officers, gardeners, store control, parking management to serving refreshments. And that’s just to mention a few! We also have opportunities beyond projects where your professional skills can help us as an organisation, so that we can do even more to fulfil the needs of the children we serve.